Happy Sunday, I hope today finds you happy and well. I for one am going to go crawl into bed and take a lovely nap, it's a little overcast today and threatening rain, (I'm hoping for a downpour!) I don't think there are many things that are better than a Sunday afternoon nap....at least at this point in my life, maybe that's just cuz I'm getting older, but hey, I guess that's one of the perks! I want to share a card I made for a few challenges and really wanted to play with this darling stamp from Sugar Pea Designs called Fairy Sweet. I totally love fairies and anything in the fantasy world and this one is just so sweet! 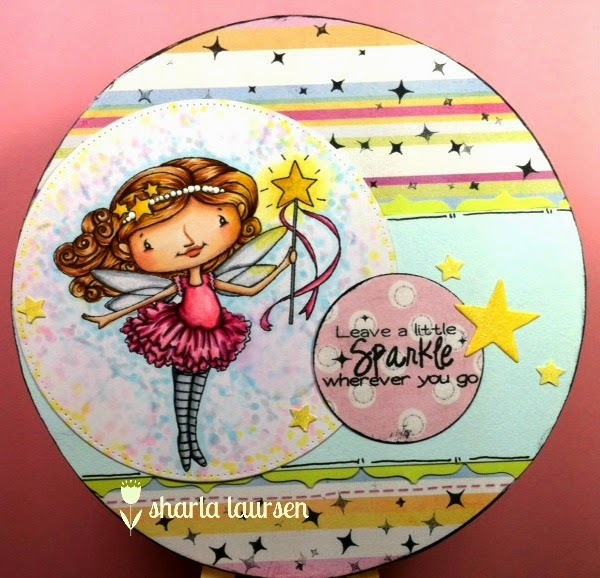 For my card I used a circle base, the I colored the image with copics and cut it out with a stitched circle die, stamped one of the sentiments and punched that out, added some stars from the stamp set and paper stars as well. I also used Wink of Stella on her wand and wings! Pretty card! Love the sweet image! Thanks for joining us at Crafty Gals Corner! Very cheerful card Sharla! Love the use of the soft colours for the Colour Challenge! Thanks for joining us at Your Next Stamp! Love your shaped card! Thank you for joining our challenge at Your Next Stamp. The circles and stars look great together. Such a sweet image. Thanks for joining in the fun at YNS!